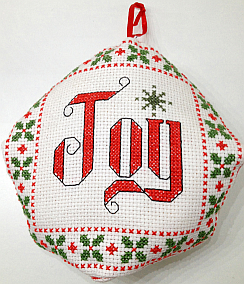 This cross stitch crafts project comes from Yiota at Yiota's XStitch. If you want some creative and original free cross stitch patterns, you should definitely check it out. Yiota used 14 count aida for this project but any leftover fabric that you can cross stitch on will work. Start by printing out pattern 1 and pattern 2. There are three options for transferring the pattern to your fabric. Stitch the top and bottom designs based on the printed patterns. Make sure you include a line of backstitch around the edge of both design (see Fig 1 below). When completed, trim the edges to 1 cm (a little less than 1/2 inch). 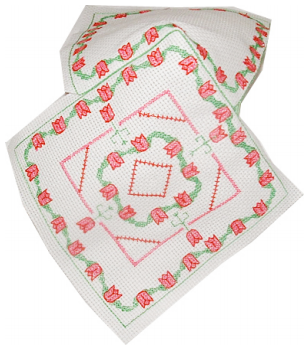 Take the bottom design and attach the central backstitch to a pointed corner of the top design. Use one strand of thread from the same color thread you used to make the backstitch line. NOTE: You do not need to pass your needle through the fabric. Just carefully pass the needle through each of the backstitches. 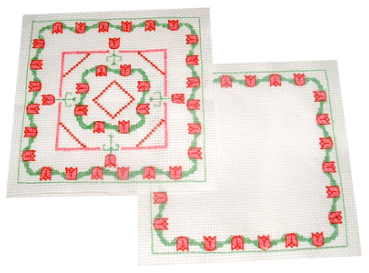 Passing your needle through the backstitch on both designs, work your way along this edge. Continue working your way along the edge until you finish sewing the sixth side of the biscornu. As you continue this technique, you'll begin to see the 8-sided shape taking place. Just before finishing, firmly stuff the ornament with polyfill to create the proper shape. Attach a piece of ribbon at the top so you can hang the ornament.